With the help of upselling sales technique you can offer more products to your customers on Shopping cart and on Thank you page. Used appropriately, the Upsell add-on can give a huge boost to your profits. To install the add-on, please go to your WP Dashboard => Plugins => Add New. Upload the zip file and activate the add-on. To get started, go to Dashboard. You can create either an offer based on one target product or an upsell offer based on a whole category. 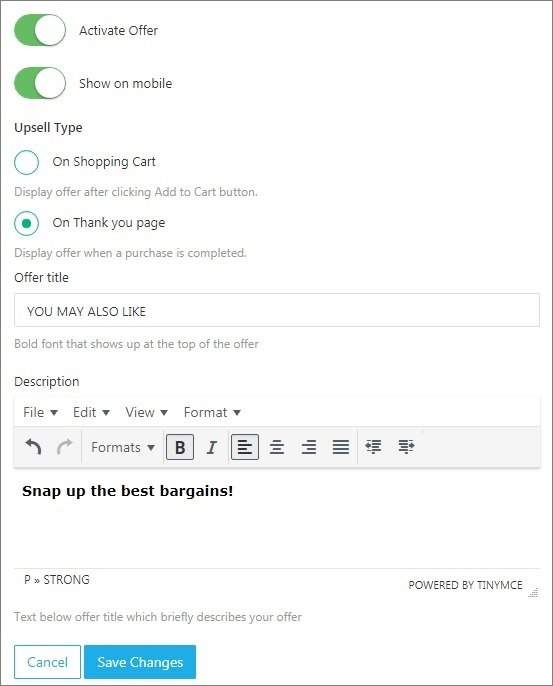 Use the Add Product Offer button to create an offer with one target product. Choose an Upsell type – on Shopping Cart or on Thank you page – and activate offer. 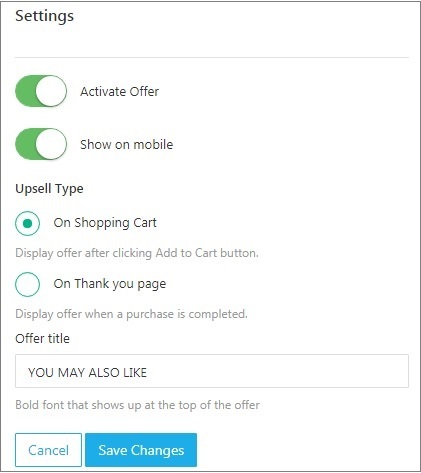 You can display your upsell products not only on desktop, but also on mobile devices – just toggle Show on mobile. 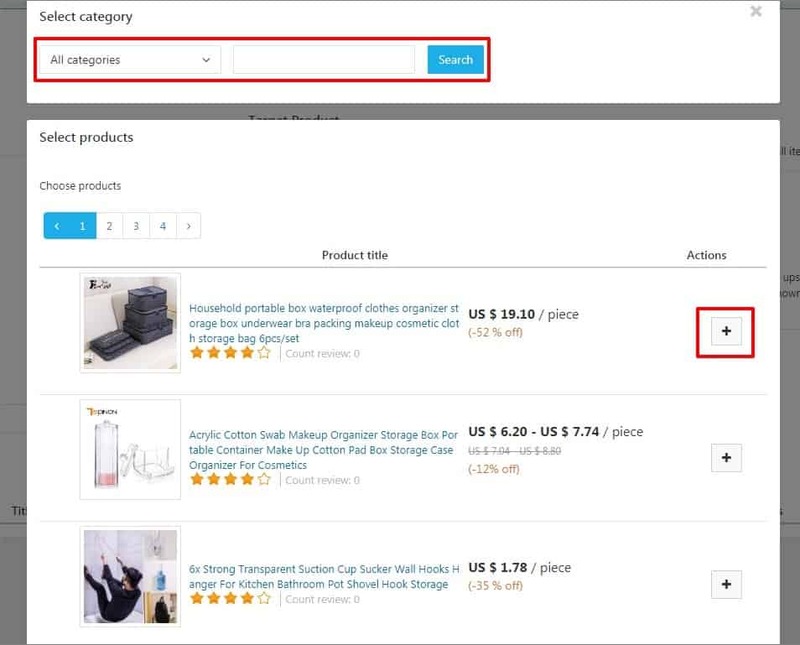 Add title to your upsell – your customers will see it above the upsell products. Apart from title, you can add offer description to your Thank you page upsell. Use the editor to make your offer stand out. Save changes. Choose your target product the upsell offer will be linked to. If no product is selected, the upsell offer will be applied to all items. Use the dropdown menu to select a certain category or search for a specific item. Click the ‘+‘ icon to add a product. Once you have added your target product, choose items to upsell. These goods will be displayed in the offer. You can show up to three products in each upsell type. If more products are selected, they will be shown randomly. In case you have a variable product, use the pencil icon to choose its variation which will be shown on your Shopping cart. Product variation with the least price is chosen by default. Simple products and variable products with chosen variation are shown with the Add to Cart button and get added to Shopping cart. If you do not want to choose a certain product variation, use the toggle to redirect your customers to single product page. In this case the Add to cart button will be replaced with View product. Alternatively, you can create an upsell offer based on a whole category. Use the Add Category Offer for these purposes. Select your Target Category from the dropdown menu and add Products to Upsell. Save changes. Once the offer is saved, you’ll see a number of new offers – your Category Offer is split into Product Offers (one target product per offer). Now you can manage them one by one.